I know, I know, I said I’d never run one… but I’ve gone and done it… I’ve signed up to run my first marathon. You may remember in my Two Oceans blog post this year, that I added right at the very end, that I’d like to run the full ultra next year… well plans have started. Last month I ran the 32km Cradle race. I did it just so that I could see whether I could get my head around running further than 21km. I’m not going to lie, it was hard. I struggled in the last 7 km, and I was really grateful that my RWFL buddy Jolene ran with me the entire way (even though I knew she was running a whole lot slower than she’d have run it without me). But I did it! I finished it in 3h40… 10 minutes slower than I’d hoped, but I’m ok with that. If you look at the bottom left photo at the bottom there, that’s me and Jolene with big smiles just after we finished that race. 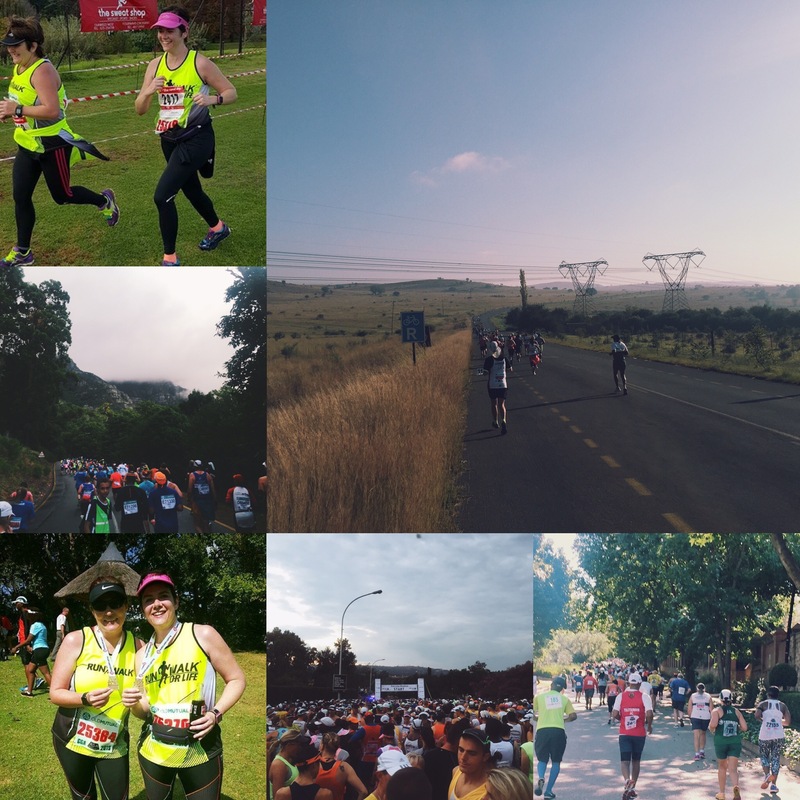 Then, last week in Soweto, after a tequila and a few glasses of wine, my colleague, Karen, said she was planning on running the Cape Town marathon in September… next thing I knew, I was also running it! LOL! So, race entries have been bought! Another RWFL buddy, Nick, has sent me a training plan that I think I can follow. I’m within range of the 6 month sub-5 hour programme, so I “should” be ok. I have 4 months to get my speed right, work on my headspace around being on the road for so long, and condition my body for the race. I’m aiming to use this marathon as my Two Oceans qualifier, which means I have to run the 42km’s in under 5 hours. It’s not going to be easy, but I’m determined to do it… and have fun in the process! I’m not going to lie though, I’m petrified, and every time I even think about it, I involuntarily take a huge breath. This is not a small undertaking for me. Before you ask, Comrades is not on my list… I’m aiming for Two Oceans, and that’s it, I’m not running further than 56km ever! So, I have a goal in sight… and lots of hours ahead of me plodding on the dark winter roads. Thanks Meea. It’s one hell of a daunting thought. You’ll be great at Knysna! Just take it easy down Simola hill! Crazy 🙂 But it’s always great to have a nice, big, juicy goal to sink your teeth into! PS have you changed jobs? It’s much easier to get on the road for a run when there’s a goal in sight. And yes, I’ve changed jobs… in the same organisation. Good luck with the training and all the preparations! You just keep pushing more and more! SO very proud of you, You go girl! Wow…Awesome stuff and inspiration right here. Maya from Zambia also running my first Marathon at the Cape town Marathon in September. All the best in your training. Aiming for sub 5hrs too! All the best with your training too!